On Saturday the 1st of April 1815 a little boy was born in Kniephof, Prussia, a little boy destined to be known by history as “The Iron Chancellor”. On that day Otto von Bismarck was born, a man who would dramatically change the history of Europe. He was one of the most contradictory leaders in history: he hated political parties, but proved a master politician; a reactionary, he instituted social security for the aged and socialised medicine; a fervent Prussian nationalist, he created a unified German state. He was a man around whom history would pivot, a man who would be the subject of many historical “What Ifs” with regard to his demise at the hands of the unstable “Kaiser Bill” and the path to World War I. A giant of a man (he was six feet five inches), Bismarck came from a moderately prosperous Junker family. Early in life he showed little promise, but marriage and some sort of religious awakening converted him into the serious and determined man who became aristocratic, autocratic and so self-assured that he was accused of believing in God only because God agreed with him on all subjects. He was also a political genius who would dominate Prussia for nine years and then a united Germany for nineteen more. 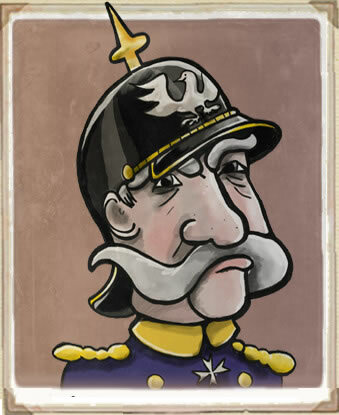 An impassioned monarchist, Bismarck became Prussia’s Chancellor in 1862. His foremost objective was to wrest control of the German-speaking world from the then dominant Austria and form a unified German state under the leadership of Prussia. To do this, his first task was to build up the army. Called Prussia’s Iron Chancellor, his nickname derived from an address to the Chamber of Deputies in which he maintained that ‘it is not by means of speeches and majority resolutions that the great issues of the day will be decided … but by blood and iron’. In 1864 Bismarck formed an alliance with Austria and used his expanded force to invade Denmark over the Schleswig-Holstein question, a labyrinthine issue that had been simmering since the early 1800s. (Schleswig-Holstein was a Danish province with a substantial German population. 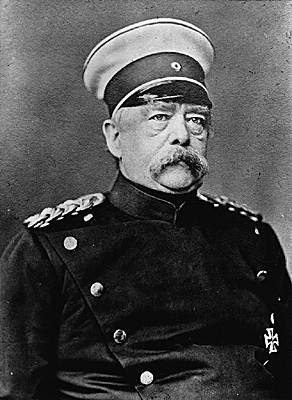 The issue was so complex that England’s Lord Palmerston once remarked, ‘Only three men in Europe have ever understood it, and of those the Prince Consort is dead, a Danish statesman is in an asylum, and I myself have forgotten it.’) Bismarck’s invasion was immediately successful, and Schleswig-Holstein became a German state. Two years later, Bismarck launched the Seven Weeks’ War against his erstwhile allies the Austrians and some smaller German states. After a major victory at Sadowa, Hanover, Hesse-Kassel, Nassau and Frankfurt, all of which had fought alongside Austria, were annexed, and virtually overnight Prussia, not Austria, had become the Germanic world’s major power. On 9 March 1888 Kaiser Wilhelm I died just a few days before his 91st birthday, and then on 15 June his son Frederick III succumbed to throat cancer, bringing the intelligent but unstable Wilhelm II to the throne. Kaiser Bill, as the British came to call him, was young (29), arrogant and determined not to be overshadowed by the great chancellor. Within two years he had pressured Bismarck into retirement, an event that sent shock waves across Europe and inspired the great political cartoon in Punch (29 March 1890) by John Tenniel called ‘Dropping the Pilot’. 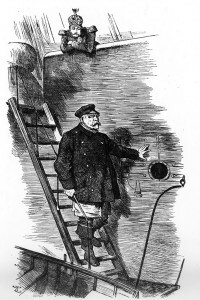 It showed Bismarck descending a ladder from the German ship of state to be taken off in a pilot boat, while from the deck above the Kaiser as captain calmly surveys his departure. Bismarck died eight years later, and within three years Kaiser Wilhelm had let Bismarck’s keystone treaty with Russia lapse, leading to an alliance between Russia and France, with all its consequences for the future. In 1914 Kaiser Wilhelm II, to use Bismarck’s metaphor, put Germany into the saddle, only to find that without the Iron Chancellor, it could ride only into a brick wall.